Your Real Estate needs are very important to me. 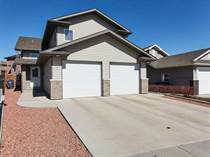 You will find many homes here that are currently for sale in Medicine Hat, Alberta. In order to find the perfect home please feel welcome to call or email me and I will be happy to set you up with a personal viewing of any property that catches you eye! View virtual tours, send my listings to family and friends, and use my exciting map search! If you don't find what you are looking for on these pages please contact me for additional information about other homes in and around Medicine Hat. I have an extensive list of additional properties that are for sale. "Amazing Location - Backing on to Park/Playground"
"A Brand NEW Home for Christmas..."
"Serenity Homes 2 Storey w/Bonus Room"
"Quiet Court & Backing on to Natural Reserve"
"Gorgeous Modified Bilevel in Ranchlands "
"Well Appointed - 4 bedrooms/ 3.5 Baths"
"Bright & Sunny Family Home in Saamis Heights"
"Quiet Location - Attractive Decor"
"Large Lot / Stunning Landscaping"
"Bright & Airy Bungalow "
"55+ Adult Community / Park Meadows Estates"
"Future Potential on 50 x130 Lot"